I-75 South to Exit 197 - Buck Road. Make a left at the traffic light at the end of the exit. At the second traffic light make a left onto Glenwood Road. Go approximately .4 of a mile and the church is on the left. I-75 North to Exit 197 - Buck Road. Make a right at the traffic light at the end of the exit. At the next traffic light make a left onto Glenwood Road. Go approximately .4 of a mile and the church is on the left. 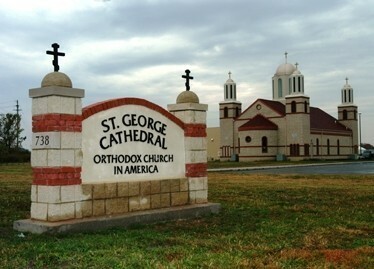 Saint George Parish began as a mission in 1934 with definite parish organization taking place in 1948. The former church building was consecrated on November 1, 1953, the feast of Saint John of Rila (O.S.) by Metropolitan Andrey of the Bulgarian Orthodox Exarchate. Participating in the consecration was then Father Kyrill Yonchev who is the present diocesan bishop of the Bulgarian Diocese of the Orthodox Church in America. Now, fifty years since that time, the new cathedral was consecrated on October 25-26, 2003 by His Beatitude, Metropolitan Herman; His Eminence, Archbishop Kyrill; and His Eminence, Archbishop Nathaniel. Use the hyperlink on this site to for more information on the consecration. Services at the parish are in English.